In 1957, experimentation with full-size vertical-takeoff was still relatively new. 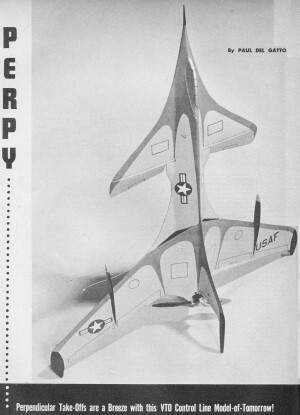 The Convair XFY Pogo is probably the most familiar of the attempts. It sat on its tail and had two huge counter-rotating props in the nose. 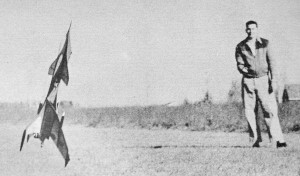 Without lightning speed computers for stabilization, it required the pilot to do most of the flying. Things just did not go well. If was not until the Harrier Jump Jet that practical VTOL aircraft became a reality. Jet engines don't suffer anywhere near as much negative effect of counter-torque. 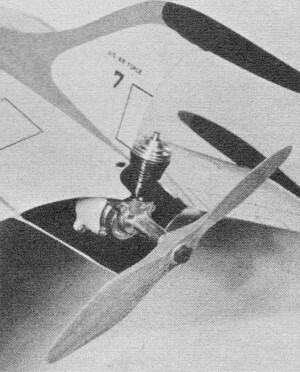 In fact, the low moment arm of the high rotational speed of the compact turbine mass actually helped stabilize the airframe. 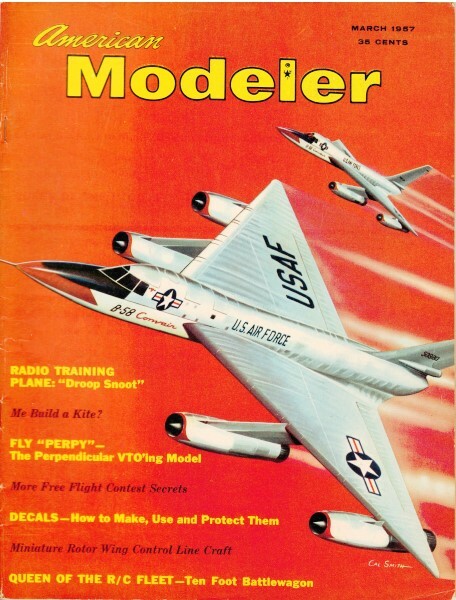 As with many aspects of model aviation in the glory days, hobbyists were eager to try their hands at those out-of-the-box (a term not even uttered yet) configurations. Here is a simple one that worked well. This was no "peaches and cream" project! We were not so fortunate as to have our first endeavors meet with success; we ran into many problems which had to be resolved before the model's performance could be measured against that of conventional configurations of similar size and structure. When we first undertook this project we expected to build it along lines similar to that of an all-balsa sport free-flight model using a Half-A or small Class A engine that would propel it into the air from a vertical take-off position. It seemed to work pretty well on paper when we compared power available to anticipated weight of the model, with due consideration to rapid acceleration. Our initial trip to the flying field was truly a disappointing one. First flight was accomplished with a hand-launch. We observed several flaws. It was evident from the start of the flight that the center of gravity was too far back to permit proper handling and control during flight. Then, too, it appeared that we had exceeded practical limitations for line stagger. Lastly, Perpy did not have enough power available to respond smoothly and effectively to the controls. We decided to use a hand-carved, pusher-type propeller with an .09 engine. The prop carved was 7 inches in diameter and of very low pitch. This combination we felt would provide more rapid acceleration from a vertical take-off position. Up-'n'-away she goes! Vertical take-offs require a "hot" .075 or .09 power plant. Half-A (.049 cu. in.) engines okay for hand· launch flying with light models. We ventured out once again to see what we could do. From the moment the "09" roared to life we sensed that everything was as it should be. When Perpy zoomed skyward upon release right to the top of the line we were more happy. The model was no longer sluggish; she responded rapidly and smoothly to the controls. Ballast that we had added forward enabled us to maintain normal trim in level flight. It was a real pleasure to see how well she handled even after the engine cut and speed gradually decreased prior to rolling in for the landing. Construction: Despite its streamlined appearance, this model is easy to build and requires only a few full evenings to complete. For those who are new to modeling some details may prove laborious, but a little extra effort should resolve the situation very nicely. It's best to begin construction with wing and tail surfaces, since much of the fuselage will be assembled around them to insure correct alignment and speedier assembly. Both wing and tail are shaped from 3/16" hard sheet balsa and sanded to desired cross section. Once wing halves have been completed bevel center edges where they join to form flush fit when negative dihedral is added. Reinforce joint with fabric and coat liberally with cement. Tail surfaces are similarly shaped. To assemble, cement elevators to brass connector on which has been soldered control horn, join this unit to stab with stitched fabric hinges. Begin fuselage assembly by cutting out all bulkheads and sides. Bend nose gear strut to shape, fasten to #2 plywood bulkhead. Join the two sides which form fuselage bottom beginning with central bulk­heads and working forward and back. When fuselage bottom has been assembled, cement wing and tail surfaces in position. Make cutout for fuel tank in wing center section (should you be using a separately mounted tank). Keep opening small to provide tight fit. Install bellcrank assembly complete with wire lead-outs. Bend wire pushrod to shape and joggle ends to simplify installation. Cut and bend engine mounts. Slight variations may be needed for different engines. Bolt engine mounts to firewall; use lock washers to eliminate vibration. Proceed to assembly of main fuselage. Once the basic fuselage assembly has been completed, rough-shape and cement in place nose block, canopy and nose wheel fairing. Strength and appearance are enhanced by addition of duct assembly. First add 1/8" square balsa bracing, then cement duct sheeting on top and bottom. Add other remaining details such as the fin assembly and fairings, wingtip wheel assembly and fairings, and lead-out guide assembly. When basic structure has been completed fill all cracks, nicks and joining surfaces; permit thorough drying; then smooth entire assembly with fine sandpaper. To apply suitable finish begin with two coats of wood filler. Next apply two coats of fuel proof clear dope. The colors we chose were yellow-orange with deep red surface trim; details in black and silver. Since we sought light weight we used only three coats of the basic color (yellow-orange) over the entire model; on top we added all our trim. Then a gentle rub-down for added lustre. Details such as hatches and control surface outlines can be done with ruling pen and India ink. 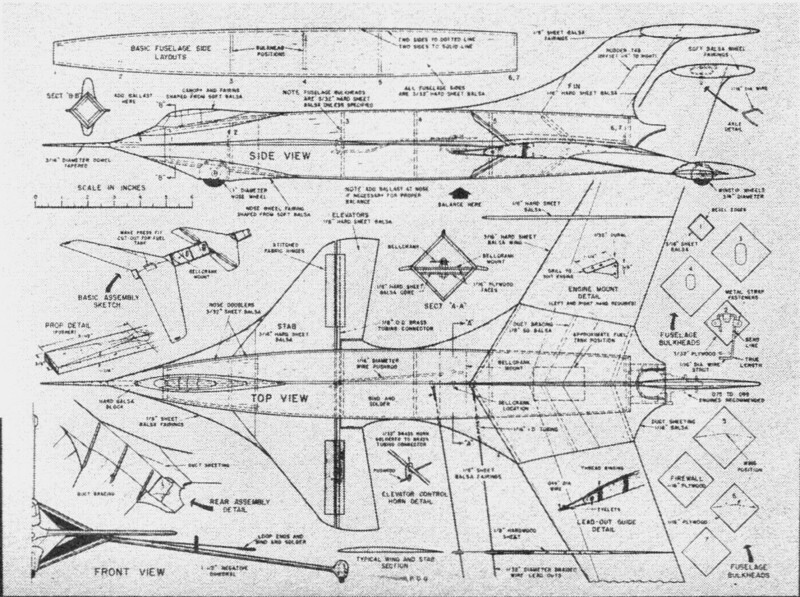 Flight and adjustment instructions appear on the full size plans.